One of the most used rooms in the home is the kitchen. It is a place to relax, cook and entertain. It only makes sense to incorporate stone elements into the room you use the most. Natural stone tile backsplashes and floors set the stage for a stunning design. Choose from sleek dark colored tiles or lighten up with neutral, light colored tiles. To make the space stand out even more, arrange the tiles in an unexpected pattern. 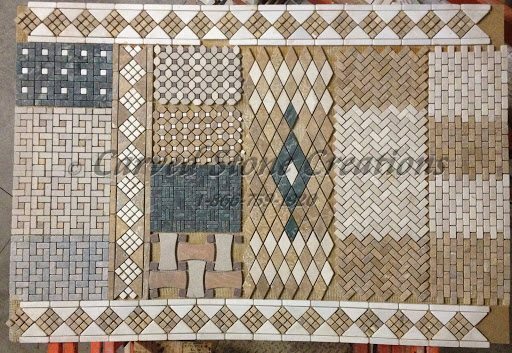 Adding a mosaic design is another way to use tile in your kitchen. Colorful stone tiles arranged in an interesting pattern makes for an eye-catching focal point. Many homes have boring stainless steel and cast iron sinks. 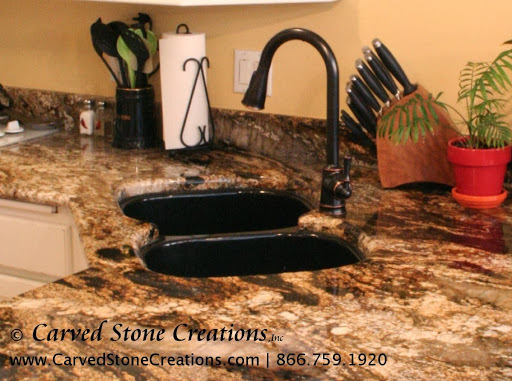 Granite sinks are a durable option with many stunning styles. Choose an undermount-style kitchen sink if you want it to blend in with the countertop, or really make a statement with an apron-front style. The front of the sink is exposed, showing off the unique qualities of the stone. You can even add a carved design to the sinks apron front! Cover up the metal overhead vent for your stove with an appealing stone hood. The large stone kitchen hood will turn into the focal point of the room. The hoods can be sleek and simple or have intricate handcarved designs. Add all three of these elements to your kitchen to make your space stand out! Contact us to start designing your own custom kitchen creations.